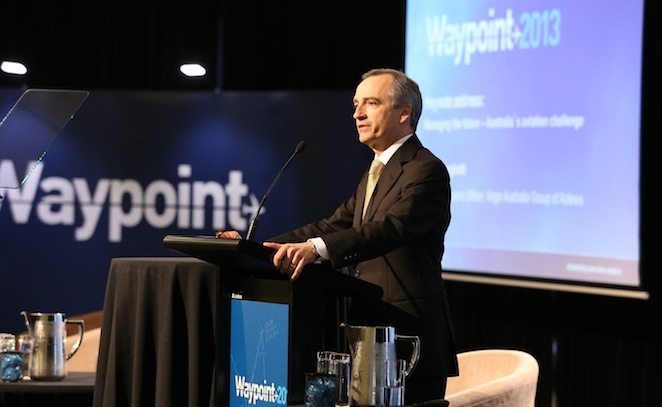 Usually mild-mannered Virgin Australia CEO John Borghetti has come out swinging in an interview about Qantas’s bid to receive a debt guarantee from the federal government. “What this is about is three different things, and people are confusing the three,” he said. “The first is, it’s about the Qantas sale act, and I do agree with Qantas that it is an outdated act and it does need to be at least diluted if not removed. There is no argument with that. “The second is Qantas’s performance, its financial performance, and its strength. And in terms of financial performance, if you look at history it will tell you that over the last decade or longer, Qantas has made not only billions of dollars of profits, but this is the first time that it has lost money in the front half of the year. And all of a sudden, it’s chicken little and the sky’s falling down! Borghetti says that, after years of profits, the only thing that has happened to Qantas is its credit rating has been downgraded. Good on you JB. Finally the facts are coming out about QF. 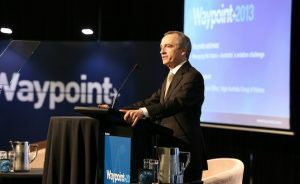 Additionally he could have mentioned something about how QF has been mismanaged – failed/failing Jetstar ventures, price fixing fines, shutting down the airline (a massive overreaction by Joyce & Co), alienating staff, cutting routes & giving away their flying to EK for free, closing engineering bases & off-shoring jobs and that’s just at the top of the my head. Now the government needs to wake up and the ACCC needs to rule against (rightly I might add) QF for capacity dumping to maintain 65% market share “at all costs”. Hopefully after the PM has told QANTAS to get there house in order the CEO Mr Joyce is the first to go. Nice to see some facts presented correctly. I am delighted that Mr Joyce shut down his airline. It allowed me to instantly become a Platinum member at Virgin, it’s a status I have maintained ever since. I know many fellow QF Lifetime Gold/Platinum Members who now regard it as more important to maintain Platinum with Virgin than QF. None of us would be flying with Virgin if it weren’t for the shutdown of QF. JB has cherry picked facts to suit his argument. VA has three very large government backed airline shareholders with two of the three being the dominant airline on the routes where they compete with QANTAS. The arguments for QANTAS government assistance are not based upon one particular entity (QF) verse another (VA). It is about aviation policy and a framework that allows whatever entity (VA or QF) to compete on an equal footing in the markets they serve. As such, to exclude the likes of Singapore Airlines and Air New Zealand in his arguments, who are both fierce competitors of QANTAS is probably a little disingenuous. It dilutes the realities of the basis for assisting QANTAS. The JB comments on the credit ratings of the two airlines (VA & QF) is simply a red herring. JB would know, as much as anyone else he can structure his debt facilities so that they can be secured by any one or all of the government airline shareholders. As such, regardless of VA’s current credit rating VA can (and I’d say probably have) receive debt terms and conditions over and above what their credit rating implies they should. JB is simply using misinformation to present his case. I am happy for JB to make comments about government ownership of airlines, but if he does, his comments should be just as much directed at SIA, ANZ and Ethiad. If he is not willing to make such comments, he probably should stick his head in. At the end of the day, if all other things were equal there would be no need for QF to receive government assistance. This is not the case and a fair and reasonable person would clearly state this. As such JB’s comments should be seen as nothing more than self serving. I’m surprised Borghetti isn’t complaining that this now makes it harder to bring in foreign cash and smash QANTAS out of the market place. The Aussie Government is entitled to do whats best for Australian Citizens, not some foreign owned company. Critical infrastructure getting taxpayer support is partially why we pay taxes, for communal infrastructure, like a national airline. The states make a mess with electricity and water, but a national airline, is the Federal Governments domain, and I support it to stop foreign invaders preying on the Aussie way of life. I should have mentioned in my last post. 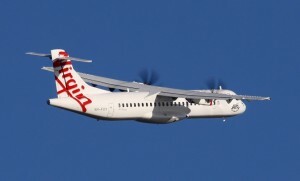 If we can remember far back enough, before the $350 million capital raising through the issue of new shares, Virgin Australia were planning on to take on debt through credit facilities offered by its three major government owned airline shareholders. The linked article has more information. 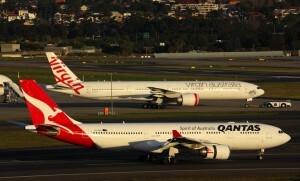 This is evidence that the playing field is not even between Virgin Australia and QANTAS. It also bring sinto question JB’s remarks about debt. Why should a company that states it has 3B in cash reserves get a helping hand in any form? It is a private company that has over a number of years clearly been the master of its own current position. Any form of assistance should not be forthcoming until such time as the board and management can prove that they have done everything possible to ensure that its business has been managed appropriately. If you want the two companies to be on an equal footing then the QSA should be removed or amended, not getting a debt guarantee from the government. This won’t just disadvantage Virgin, but every other airline in the Country. The fact remains that the current QF management have made such a mess of Qantas, that’s why they are in this position. Additionally, if you believe JB’s comments are self serving, then how would you describe Allen Joyce’s comments? Please read this article to see the truth. I don’t disagree about government assistance distorting the market. In an ideal world, yes, government assistance shouldn’t be given. The reality is QANTAS operates with a legislative environment that distorts the market in preference for its competitors. On top of this it has to compete with government owned and backed airlines on a good proportion of its international routes. So, regardless of what JB said or the article you linked infers, the realities are that QANTAS operates at a disadvantage. If we look at the legislative side of the equation we have two of the three major parties (labour and the greens) both seeing QANTAS as the national carrier. In addition to this, both of them believe there is national interest attributes associated with Qantas that needs to be maintained. As such where the current government would probably repeal the QSA, the reality is any such legislation to do so would be blocked in the senate. I would suggest Allan Fels is talking from a purest perspective and as such his views are probably not shared by both sides of government. If they were our discussions would be much broader than just government assistance for QANTAS. They would include not only include repealing the QSA, but amending the ANA with regards to foreign ownership requirements and dumping rules. There is a lot more to this debate than simply the self-interests of Virgin Australia. In a proper debate their comments should be welcomed, but unfortunately, I don’t see Virgin Australia, a company that has spent something close to $1.2 billion transforming itself in to a premium carrier as acting responsibly or within market bounds. The previous article I linked has information that adds to the debate. It is worth reading as it shows how standard investment rule multiples are not being followed by Virgin Australia. Qantas is in its current position due failure to restructure and modernise. Take a look at what the major airlines in American have gone through to return to profitability… sure they have used Chapter 11, however many of the structural changes have been obvious and should have been implemented in Qantas long ago. Even with 65% of the market QF can’t make money… surely this tells you something!!! For years Qantas has had just one strategy. More than 65% market share!!! Which their Directors believe will miraculously turn the airline around. It is long over due that ASIC and the Government calls Qantas on its ongoing abuse of Section 46 of the Competition & Consumer Act… protected by its elite status and market position Qantas has engaged capacity dumping and flooding markets with ridiculously discounted inventory which has sucked the life out of many competitors (whose presence has stimulated, innovated and grown markets), and it is this behaviour that has substantially contributed to the mess facing Qantas today. No Government assistance for QF is what most Australians want. The reason being that a LOT of Australians have lost their jobs in companies which have had to cease operation – i.e. Ansett, Holden, HIH to mention a few. They asked for Government assistance and were denied it. I know the reasons vary as to why in each case – but -regardless the Government did not assist any of these Companies in any way – leading to their demise. So why is it even being discussed as to why or why not the Government should assist QF to stay gasping on a prolonged life line when blind Neddy and his eye seeing dog can plainly see that there is no good outcome for QF until either the useless Mr Joyce and his cronies go, QF gets its act together and does what has to be done or both. The only people on a down hill slide out of all of this are the employees – and they are the very reason why QF exists. They do the face to face contact with prospective clients and all of the hard work logistics on a daily basis. If job cuts in QF are to be undertaken then start from the top and sack Mr Joyce and the entire board. That in itself would be a huge advantage to stem the demise of QF….which will eventually happen. I had heard that when AN collapsed QF wasn’t far away from folding itself. Looks like the chickens may be coming home to roost after all. QF management need to grow up forget about the line in the sand and work on profitability. If they kill the airline then that 65% goes to whomever is left!